The plant is robust and can grow as tall as 60cm tall. Like Orchis mascula, the upper part of the flower stem is washed brownish-red. It is the leaves and flowers that set it apart: lacking the large dark oblong spots of Orchis mascula, the leaves of Orchis mascula subsp. speciosa are more rounded at the tips and are washed with numerous rust-coloured small spots particularly towards the base. The sepals and petals of Orchis ovalis are long and pointed. The dorsal sepal and petals form a bell-shaped hood over the lip of the flower. The lip of the flower is three-lobed and the margin has a scalloped and fluted appearance. The distribution of this orchid is still being debated due to confusion with other species. It flowers at the same time and has much in common with Early Purple-orchid Orchis mascula. Accurate identification and confirmation of distribution is further hampered by the occasional and isolated occurrence of this elusive but beautiful orchid. It is mainly recorded from central Europe in countries which include Slovenia, Poland, Romania and Austria. 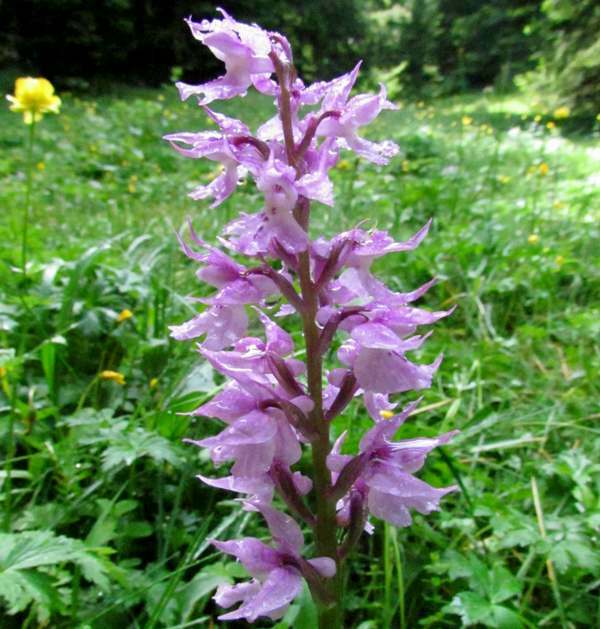 Western and southern plants show a greater similarity with Orchis mascula, but in central and eastern Europe Orchis mascula subsp. speciosa is thought to replace Orchis mascula entirely. Tolerant of both alkaline and slightly acidic soils, this is essentially a montane species. The Bohemian Early Purple-orchid flowers from the end of April until the beginning of July. 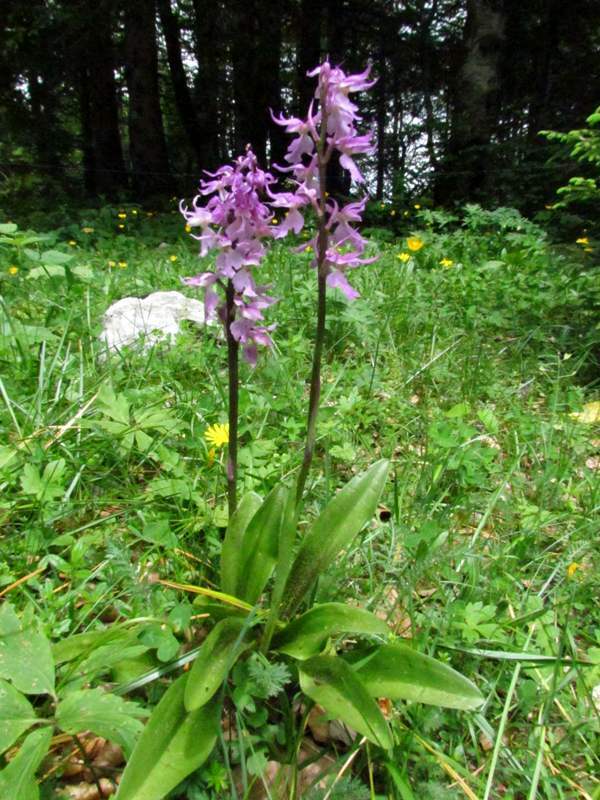 Unlike the Early Purple-orchid it grows high up in mountains, and the higher up they are the later they flower. 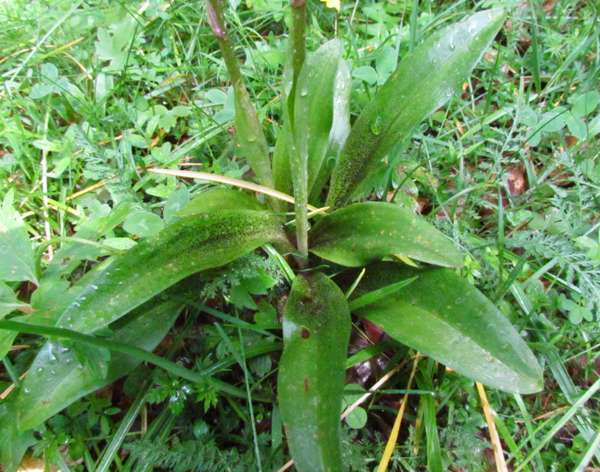 The leaves of Orchis mascula subsp. speciosa are rounded at the tip and are flushed with tiny rusty-brownish spots particularly towards the base. The specimens shown on this page were photographed in the Julian Alps in Slovenia in mid-to-late June at an altitude of around 700 metres.